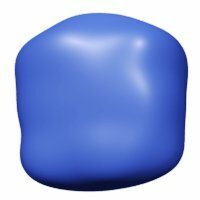 PRMan 13 ships with an Implicit Field plugin that interprets Maya Fluid Cache files as level-set surfaces. The impl_mfc plugin expects 23 float arguments and two strings. The first string argument must be "mfc". (In the future other values may be used to signify other volume file formats.) The second string is the name of the Maya Fluid Cache file. 0-15 A transformation matrix that maps coordinates in the fluid field to object-space coordinates of the Blobby. 17-19 The x, y, and z size of the fluid volume. The center of the fluid cache grid is placed at the origin, with corners at (±x/2, ±y/2, ±z/2). 20 The timestep used for motion blur. This is only used if the Blobby is in a MotionBegin...MotionEnd block. It is used as a multiplier for the velocity information in the Maya Fluid Cache file. 21 The presumptive minimum value of the samples in the fluid file. This value will be mapped to a Blobby field value of zero. 22 The surface threshold value in the fluid file. This value will be mapped to the default Blobby field threshold value, which is 0.40535371318524. If one wishes to use data from the Maya Fluid Cache file for shading (for example, Maya Fluid Cache files store temperature data), it can be done by declaring the data after calling the plugin with ["impl_mfc" "mfc" "test.mcfp"]. Note that the data must be called as vertex-type variables. With the release of PRMan 17.0, the impl_mfc plugin now supports the newer nCache file format for fluid caches, introduced in Maya 2009. The 23 float arguments have the same meaning as described in the table above. The plugin supports both "OneFilePerFrame" and "OneFile" cache types. In the case of "OneFilePerFrame", the frame number (argument 16) is ignored. 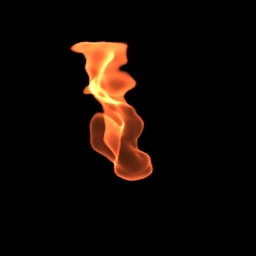 Below is a render of Maya's "flame" example using the the plugin. The "fire" shader is the same one as described in the volume rendering app note.